Are your signage and displays not being recognized at tradeshows? First impressions really do count and nowhere is this truer than in the events, tradeshow or exhibition arena. Statistically your tradeshow display only has 8 seconds to draw someone in, any longer than that may cause the exhibitor to go towards a competitors display. To make sure this doesn’t happen, you need to turn to Display Design to ensure that your tradeshow display stands out amongst the crowd. 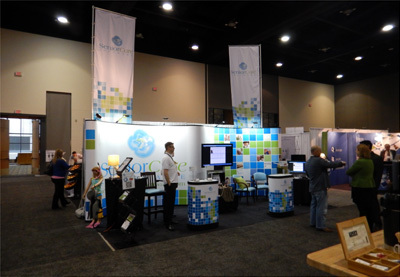 Display Design offers a variety of Popup Displays, Banner Stands, Table Top Displays, Modular Exhibits, and Custom Exhibits, to make sure that you and your company are well represented at your next Edmonton Tradeshow. 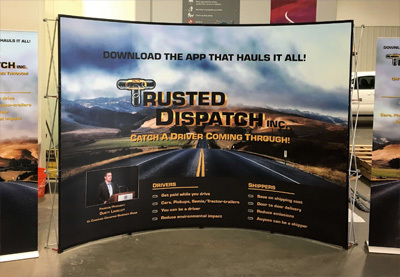 Most companies at tradeshows will just use the Table Top Displays with maybe a Popup Display or Banner Stands, but we recommend using a Custom Exhibit. Custom Exhibits allow you to combine all of the products mentioned above, with Laminate, fabric, graphics, extrusions, interactive modules, seating, furniture, all included in your Custom Exhibit. We will work with you to design and build your exhibit to give you the edge you need over your competition. Do you have a unique idea for your booth? Contact Display Design for more information about our Custom Exhibits and any other Edmonton Tradeshow displays you require!